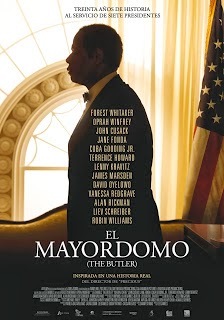 Reparto: Forest Whitaker (Cecil Gaines), Oprah Winfey, Jane Fonda, Alex Pettyfer (Thomas Westfall), Alan Rickman (Ronald Reagan), Melissa Leo (Mamie Eisenhower), John Cusack (Richard Nixon), Oprah Winfrey (Gloria Gaines), Cuba Gooding Jr. (Carter Wilson), Terrence Howard (Howard), Lenny Kravitz (James Holloway), Robin Williams (presidente Dwight D. Eisenhower), Liev Schreiber (Lyndon B. Johnson). Guión: Lee Daniels y Danny Strong, basado en un artículo de Wil Haygood. Producción: Lee Daniels, Cassian Elwes, Buddy Patrick y Laura Ziskin. Productoras: Laura Ziskin Productions, Salloway Rubenstein Productions y Windy Hill Pictures.